We are re-opening enrollments in to the 50 ways to analyze data program in two weeks (on 10th of May, 2017, Wednesday). I want to share the process, techniques and visualizations you can use to analyze any business data with a case study. In this series of articles, let’s analyze fairly complex and large data set to derive insights. Please join our Analytics Email Newsletter to get all three parts of this series and information about 50 Ways to Analyze Data program. Since the original data shared by Mr. E is confidential, I made up some random call data in Excel. Here is a sample. The calls data is maintained in an Excel table, named calls. We have 288,625 rows in this table. Let’s examine the columns in detail. The problem – How soon do we help? We need to answer the question – how soon are we helping the callers? This can be answered in a variety of ways. Mr. E’s email was about how to calculate the earliest Enroute DTS and corresponding Onscene DTS values. In this article, we will explore ways to calculate these values using various Excel techniques. In the next article, we will analyze response times by various dimensions to understand the trends better. We can use a variety of techniques to calculate the earliest enroute time. This is where Mr. E got stuck and emailed me. He was implementing an array formula to fetch the earliest enroute time using MIN and IF formulas. Assuming a call number is listed in cell H4, we can fetch earliest enroute time using below MINIF formula. While this formula is technically correct, Mr. E faced a curious problem. Not all units chose to attend a call even after taking it. This could be because they chose to go on another call or realized that another team is already on the way. So quite a few items in [Enroute DTS] are blanks ie 0. Now, because we are using MIN formula, it fetches 0 as the earliest Enroute DTS, which is clearly a wrong answer. We can add an additional check to handle blank [Enroute DTS] entries. While MINIF formula is a simple & elegant solution to this problem, it is not scalable. Mr. E had close to 300,000 calls spread among 400,000 rows in the calls table. This means when you want to calculate earliest Enroute DTS for all the 300,000 calls using MINIF, you can take a very looooong coffee break. 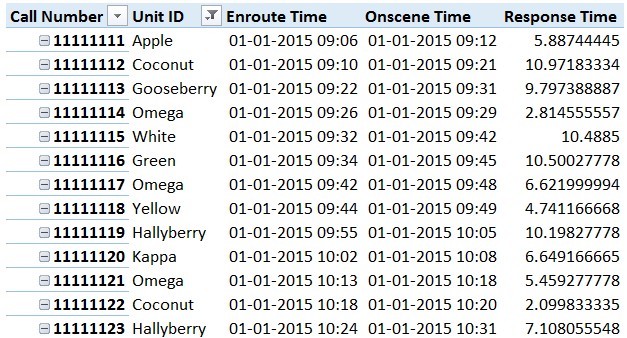 We can use VLOOKUP to return first occurrence of Enroute DTS for a given call number. We needed earliest value of Enroute DTS, not the first value. Well, what if we sort the calls table by call number and Enroute DTS? Now, VLOOKUP should fetch earliest Enroute DTS. should fetch the earliest Enroute DTS for a call number in M4. While VLOOKUP is easier than MINIF and gives us the answer we want, it too is not scalable. On my sample data of 300,000 rows, the VLOOKUP approach took more than 2 minutes. On a production data set, this approach could mean disaster. Why bother with exact lookups when an approximate one would do? That is logic behind this approach. We find the first call’s earliest Enroute DTS using regular VLOOKUP method as mentioned above. Notice that we refer M4 to fetch earliest Enroute DTS for M5. This approach is significantly faster than VLOOKUP or MINIF solution. On test runs with same dataset, this approach took just a fraction of second. That is roughly 100 times improvement in speed. If you must use a formula approach, use this. Now you get a sparkly clean pivot with what we need. This is the quickest of them all. Very simple and scalable upto a million rows (although when you have so many rows, Pivot calculations can be slow). I recommend that you use Pivot Table approach whenever you are solving problems like this. While pivot table approach gives us the answer we want in a quick and efficient fashion, it has few limitations. This is where Power Pivot truly shines. Related: Introduction to Excel Power Pivot. Let’s build a Power Pivot model around the problem. Now, add the first 3 measures to a pivot table. Place call number & unit id in row labels area. Set up tabular layout for the pivot and viola, our answer is ready. If you have Power Pivot on your Excel, use this method all the time. This allows you lots of flexibility. You can also build additional measures to analyze the data. We will see some of these ideas in next part of this article. Click here to download sample workbook containing all these solutions. Play with various formulas and measures to learn more. Beware, some of the formulas can take lot of time to re-calculate. The purpose of any analysis is to uncover patterns, information and decision pointers buried in data. We explore more themes and techniques for analyzing data in 50 ways to analyze data program. Do check it out. After helping Mr. E, he sent me below email. This is one of the reasons why I run Chandoo.org. Everytime I read a testimonial like this, I get a big bright smile on my face. I just wanted to say thank you very much. Although some of my columns are still calculating (holy smokes it takes a long time), the ones I’ve applied this solution to are working brilliantly. You’ve helped me solve a very big problem for the xxxx county sheriff’s office in California; serving some 400k people. I thought that might be a nice feather to put in your hat. Thank you E for emailing an interesting problem. If you like this and want to learn more about data analytics, understand how our 50 ways to analyze data program can help you, sign up for our course newsletter. Please click here. "Pivot tables cant work when you have more than a million calls"
I'm pretty shure they can as long as you hook up the pivot table directly to a database (so the data isn't loaded into a worksheet). In 2013/16 you can also load data > 1m records directly into the data model without needing Power Pivot. Since I discovered Power BI, Tableau & SpotFire, I enjoy playing with data & discovering patterns. One thing to check also is in the raw CAD data there is typically a column with some vague name that indicates the order of the time stamps and that can be used to filter the initial query down better. Great article as usual! I was thinking 2 nice variables to add to this analysis would be the nature of call and the location of each unit from caller location. I think it might be beneficial to know if certain types of calls are being responded to faster or slower than others keeping distance as a constant. I'm a bit of dilemna with my tasks. I have a table which tells me how long a room was out of service due to refurb. It has a column for From and To. The formula or macro must check each row and perform the action. Once done, it moves to the next row. What are your thoughts? Would you recommend any other way?